It's been a hot summer in the San Francisco Bay and many scorching afternoons, I don't even want to look at an IPA. So for the past couple months my fridge has been full of the yellow stuff as I've made a point this summer to explore various Lagers, Pilsners, and Hefeweizens brewed by California breweries. It's been an interesting exercise delving into to these sometimes maligned styles. To explore these beer's unique character takes more concentration than with California's IPAs, which mostly slap you in the face with and say "here I am". So for this month's Session, where Alistair Reece asks us to crack open a few Pilsners to compare and contrast what he considers "the pinnacle of the brewing craft", I was already on board. I'll start with Pilsner Urquell, which was once considered the text book example of the style, but many feel has declined with the onset of higher volume production. I won't enter into that debate, but it's a crisp, clean Pilsner with light cracker like malt and a comforting grassy hop character. It looks gorgeous in the glass with the classic white head leaving rings around the glass to signify each sip. Pilsner Urquell may have lost a step, but it's a fine beer in my book. Let's move on to one of my long time go-to summer beers, Lagunitas Pils. Most of the time, I've enjoyed this beer without too much thought and concentration, which is probably the way it ought to be. Taking a moment recently to focus on its flavors, I noticed a rather bready malt for the style. The hops are more earthy, a little grassy, and if I patiently waited for it, a nice little spicy kick would sneak in at the end. Now Pilsner Urquell and Lagunitas are major international brands. 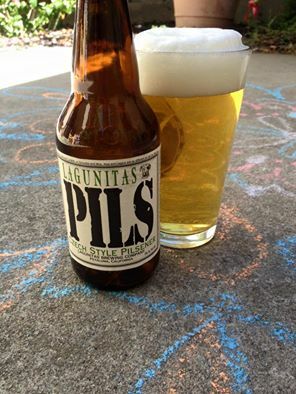 What about Pilsner from the smaller breweries local to my home in San Jose, CA? Well, there are a couple issues here. First, most small breweries in the area don't have any cold-fermenting equipment, so couldn't brew a Pilsner even if they wanted to. And I lot don't want to, because Lager styles have a bit of a bad reputation around here, undeservedly so, I might add. For decades, our country was saturated with a bunch of cheap lagered beers, brewed through a bunch of short cuts. Arguably, the most successful Pilsner in the United States was Miller Lite. I think things are changing for reasons I'll get into a little later. The good news is that I did find a couple good Pilsners from breweries just a short drive away. Such as the special release Dry Hopped Pilsner I discovered at San Jose's Hermitage Brewing's taproom this summer. Dry hopping a Pilnser isn't very traditional and seems in the spirit of the American "anything goes" brewing culture. The nice thing about our country's brewing mentality is that it created unexpected pleasures, in this case, the wonderful floral aromas that greeted my nose as the brew was set before me. There's a little sweetness from the touch of Munich malt they use, but it hits the crispy cracker malt note and finishes with a moderate floral spicy bitterness. I just hope Hermitage, which has made their claim to fame mostly on single hop IPAs and barrel-aged brews, decides to brew this simple pleasure year round. Then there's Shimmer, an organically brewed Pilsner from Discretion Brewing located "over the hill" in the beach side town of Santa Cruz. Shimmer delivers an herbal hop wallop on top of its dry, bready malt base and light effervescence. A little hop resin is noticeable on the finish in this highly assertive Pilsner. I'll finish a little theory on why we can expect to see more Pilsners in the United States from smaller breweries. They sell. People like to drink Pilsners. The growth of craft beer has grown the point where it is no longer catering to the various niche's of specialized tastes but has become mass market itself. A funny thing small brewers are learning along the way as is that the general population does not necessarily thirst for hop monsters, big alcohol bombs, or super-duper complex barrel-aged brews. Most people just want something flavorful to drink. Pilsners also bridge a narrow gap between simple Lager refreshment and American hop experimentation. Now with American brewers penchant for playing around with traditions, we might see things like Pilsners brewed with Mosaic hops or Black Pilsners, which might I'm not so sure would be welcome innovations. But at any rate, I'm looking forward to drinking more American Pilsners as brewers in this country establish their own Pilsner tradition. Nice write-up but I would vehemently disagree with your categorization of Miller Lite as a pilsner. Just because the brewery says it is so, and often, does not make it so. But it does highlight the power of money in our political, whoops, commercial discourse. Although Miller Lite may be a lager, it is no more a pilsner than AB InBev-brewed Bass, although an ale, is an IPA.